Well, if you want to get some good laughs with your costume this Halloween, we’ve got the perfect one for you. Fruit alone isn’t all that funny, this is true, but there isn’t really anything more hysterical than produce with a bad attitude. Check out this Banana Flasher Costume and try not to laugh! In the fruit world, it is a well-known fact that the bananas are the crazy ones. These wacky, potassium-filled guys are always running around getting into some zany trouble. What kind of trouble? Well, they just hate wearing their peel suits so they're always finding reasons to unpeel and enjoy the breeze against their bare fruit. They describe it as an unfathomable degree of freedom. So if you want to show off the naturalistic side of your favorite fruit then this flashing banana costume is perfect for you. You and a group of friends can all grab fruit-themed costumes this year and go out as the rowdiest fruit salad anyone has ever encountered. You, of course, will be the wild card of the gang. While grapes, apples, and berries may feel comfortable in their own skin, it will be your duty, as the banana of the group, to let it all hang out! 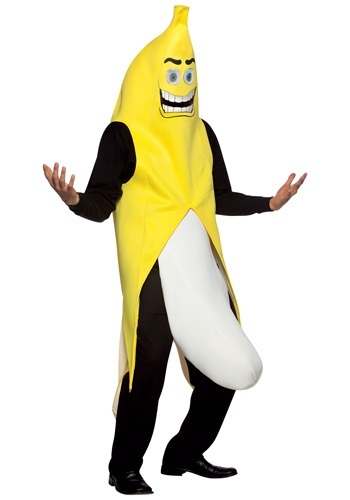 Change everyone’s view on bananas this Halloween when you go out in this Banana Flasher Costume. Along with giving everyone an eye peeling experience, you’ll be sure to get plenty of laughs… Maybe a scoff or two but don’t let that ruin your fruity fun!